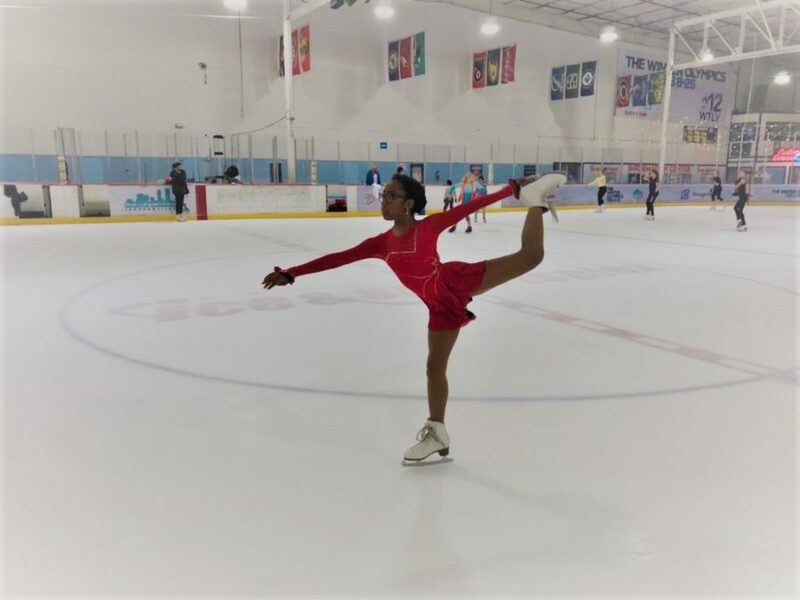 While there is a warm fire in Fapianey Alexandre’s (‘21) heart for the deaf community, she spends much of her time on the frigid ice. In her two separate lives she balances personal success gained through skating with the joy of helping others as an American Sign Language interpreter. Alexandre was first introduced to ice skating during a church trip to the rink and instantly enjoyed it. Initially supportive, after she received a concussion from falling on the ice, her parents discouraged Alexandre from skating, believing it was too dangerous. It wasn’t until 8th grade that her parents allowed her to skate. Alexandre considers herself late to the sport, since many people who want to pursue a skating career start the sport around five years old. She doesn’t view skating as a long term career, though, instead as an activity to enjoy and learn from. Skating, an outlet to dedicate her time to, directly translates to her success. “Most of my time and energy is spent at the rink.” Skating requires immense strength and flexibility resulting in countless hours of off-ice training. As it is Alexandre’s first year at Bolles, she is taking a break from skating, to adjust to her new school. Currently she just skates on Saturdays, but is confident she will soon resume her usual skating schedule. While ice skating, Alexandre was able to gain personal success, but her ASL interpreting granted her the opportunity to help others. Alexandre first learned American Sign Language (ASL) in a 4th grade class and has since taught herself ASL and become more immersed in the deaf community. She argues learning a new language isn’t as hard as most people perceive, especially since she was young when she learned it. Unfortunately, Alexandre has also experienced some of the disrespect toward the deaf community. She explains that many in society have an incorrect perception of deaf people. While signing in public with deaf friends, she sees and experiences the struggles many deaf people face. Alexandre said sometimes restaurant waitstaff will give deaf people braille menus, which are meant for those who are blind or visually impaired. For Fapianey Alexandre, both on and off the ice, every movement has a meaning whether it’s a conversation in ASL or a graceful skating routine.